There's one more One Book A Day this year in November. If you're an author or publisher who is interested in sponsoring Unshelved drop me a line. Spike is the author of Templar, Arizona a long-running character-driven webcomic. I've been hearing great things about Spike and her comics for years, and it was a pleasure to finally meet them both this spring at Webcomics Weekend. I'm on the road this week, and she came to my rescue with today's slightly morbid Unshelved Book Club. Enjoy, then head over to her site to find out more about these characters! This week's strips feature a visit to the library by Owen and Desmond from my new comic strip Not Invented Here, which launches Monday. 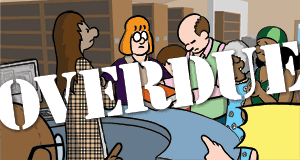 Since Gene Ambaum and I first created Unshelved, a comic strip drawn from Gene's experiences as a librarian, people have asked me why I didn't start a comic strip based on my two decades in the software business. After several false starts it's finally ready. This time around I wanted to write, not draw. It would be pleasantly symmetric if Gene could draw, but how-shall-I-say-this he can't. I was lucky enough to snag one of my favorite cartoonists, Paul Southworth. Paul is one of the most talented and respected artists in the business, and also a really funny and sweet guy. Paul wrote and drew Ugly Hill for four years and currently makes a weekly panel about videogames called You Are Dead. Earlier this year he contributed this book club of The Road. And yes, that's him guest-drawing this week's Unshelved. Not Invented Here by Bill Barnes and Paul Southworth runs Monday through Thursday every week. I hope you enjoy it as much as you enjoy Unshelved, and I also hope you'll tell your friends about both strips.